Proper daily skin care is fundamental to looking your best. Extractions are the foundation of our facials because they remove clogged pores and give your skin a newer, fresher foundation for your skincare products to penetrate. All of our facials begin with our European Facial and from there are modified to your skin type to give you the best results. All of our products are organically sourced and allergen free. 75 minutes $125 | This deep-cleansing treatment includes exfoliation, steam, extraction, massage, and an individualized mask. Your face will be cleansed with sulfate-free cleansers, gently exfoliated to remove dull surface cells and richly nourished with customized serums. Your face, neck, and shoulders will be massaged with artisan oils and an individualized mask will be applied for optimal results. Hands and feet are massaged and placed in heated mitts and booties for additional relaxation. Pure Bliss…. Book Online. 90 - 120 minutes $155 | This deep-cleansing, clarifying, and anti-inflammatory treatment for acne-prone skin includes extraction, lymphatic drainage, and natural sterilization with oxygen to prevent post-facial breakout. We go pore by pore to remove blackheads, bumps under the skin, cysts and pustules. A soft lift off mask of Dead Sea minerals and Algae balances oil production, increases hydration and calms the skin. Can also be used on the back. Our acne facial provides instant gratification with an immediate, visible improvement. Book Online. 90 minutes $145 | A luxurious facial that nurtures skin, feels wonderful and makes you look terrific. Following our European facial you’ll be rehydrated with a unique gel peel-off mask to promote product absorption for the deepest hydration. Book Online. 90 minutes $145 | An anti-aging treatment in which purified, pressurized oxygen is applied to the skin. Following our European facial, vitamins, collagen and elastin are forced into the skin with a pressurized oxygen dome. Provides healing and antibacterial benefits, and enhances the absorption of anti-aging products for refreshed, supple skin. Book Online. 90 minutes $145 | Allow your skin to begin an immediate beautifying process. 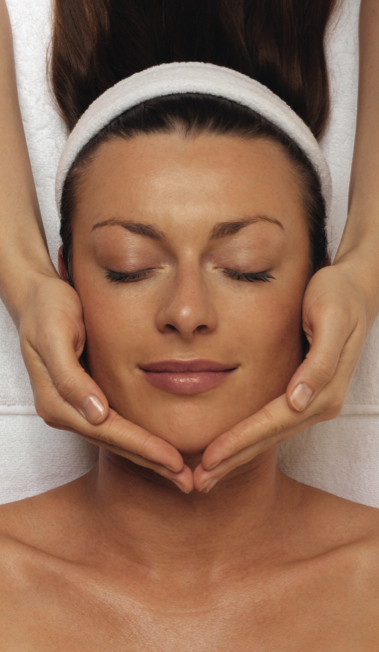 Following our European facial, the sinus's are cleared with a lymphatic drainage massage. An activated charcoal and mint mask is then applied, creating oxygenating effects through the elevation of body heat and circulation. Book Online. 90 minutes $145 | Ideal for sensitive or Rosacea skin. Following our European Facial, soothe the skin with this gentle facial that minimizes inflammation and redness and helps to strengthen the capillaries for smoother, younger looking skin. With reduced puffiness and improved texture, your skin will have a healthy glow. Book Online. 90 minutes $145 | Dare to defy time! Ideal for dehydrated, dry or mature skin; following our European facial, this facial delivers visible results with cutting edge ingredients and microcurrent technology. Fight the signs of visible aging and reduce those well-earned fine lines and wrinkles. You will leave refreshed, and glowing...Timeless. Book Online. 90 minutes $165 | The ultimate luxury facial for those concerned with hyperpigmentation and age spots. Following our European facial, indulge your skin with richly textured, lavish Caviar extracts to effectively firm and revitalize. Book Online. 90 minutes $175 | Out with the old skin cells and in with new, young, healthy cells! Following our European facial, this treatment combines growth factors with microcurrent technology to stimulate your skin’s ability to protect and renew itself by replacing damaged collagen and elastin fibers. Potent antioxidants work to rebuild and revitalize skin. Skin texture will quickly begin to appear smooth and supple, firmer and more resilient. Book Online. 120 minutes $245 | Our signature facial is designed to restore, lift and revitalize the skin. Following cleansing, exfoliation, steam and extraction; microcurrent is used to lift and tighten the facial muscles. Revitaneedling is then used to target fine lines and wrinkles by stimulating your body’s natural healing response and increasing collagen production. Stem cells are introduced to the skin to further results. Finally, a unique soft lift off mask is applied to further product absorption and hydrate the skin. Book Online.